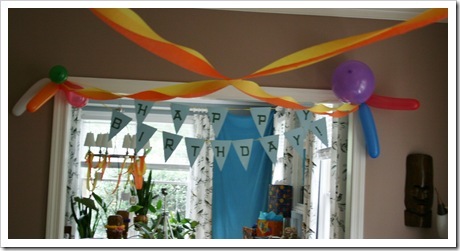 Like everything we do around here our son’s 2nd birthday party was all about budget. Not to just cheap out, but the reality is that the older he gets and the more kids he knows, the more expensive these little shindigs are going to become. 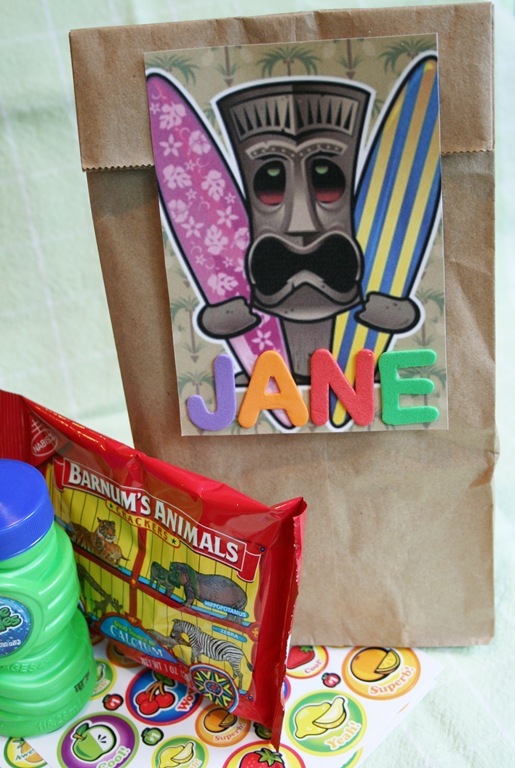 Not only did we want to celebrate his big day with him, but we thought it would be fun to expand on the “playdate” idea and invite his playgroup friends over with their families. That way my husband could meet the other dads and we could all socialize for a short time while the kids went crazy- plus we needed someone to eat all the cake! 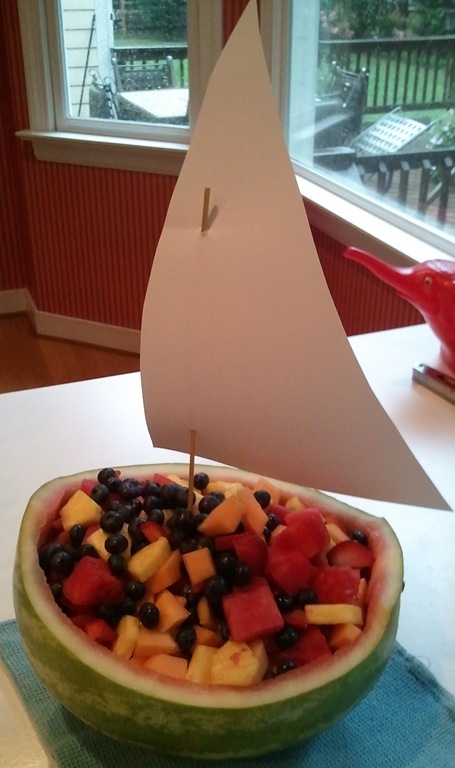 As you know from the post earlier this week, we went with an “Island” theme. This was part of our "cheap” plan because we wanted to include water activities to keep the kids occupied. Meaning we could set up our already-owned sprinkler and kiddie pool and let them have at it. Being that they are all two-year-olds anything involving water and getting wet equals big fun. So, I dusted off my Photoshop skills and applied them to Paint.net. I have to use Paint.net because I lost my Photoshop set up when I got my new computer a couple of years ago. (I don’t know how that happened exactly, but I no longer question the tech guy.) I say dusted off, but really they were never anything to get excited about in the first place. 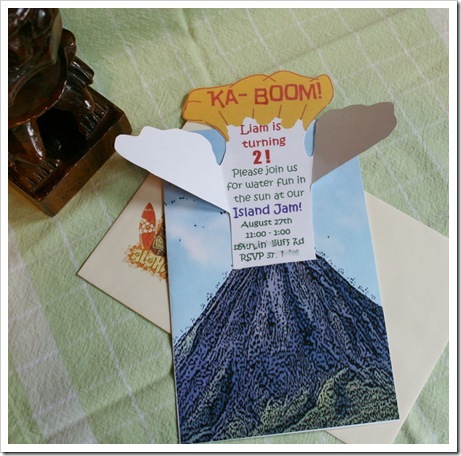 Using clip art that I scrounged up through Google, I managed to put together an erupting volcano card for the announcement. 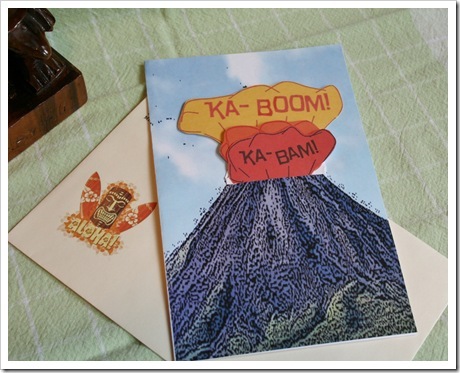 The invite reads, “KA-BAM!, KA-POW!, KA-BOOM! 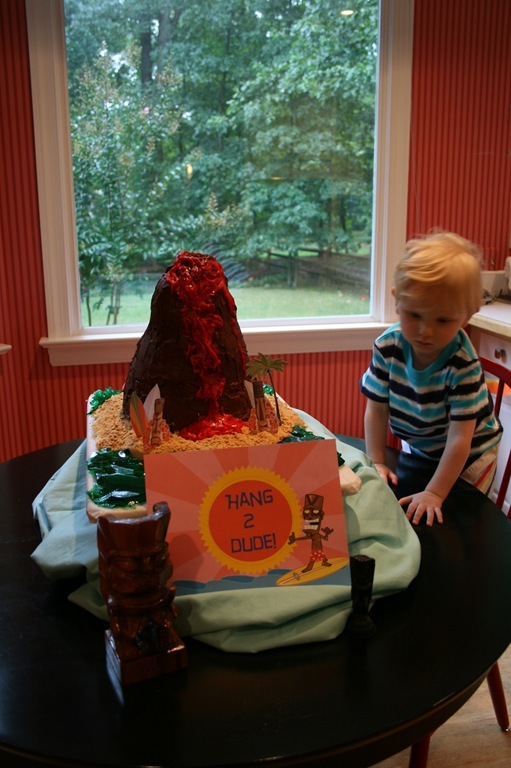 (on each puff of erupting smoke) Liam is turning 2!, Join us for water fun in the sun at our Island Jam!”, followed by the address and RSVP number. Simple, but effective. 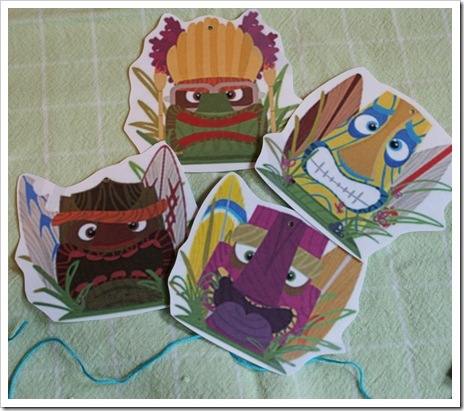 I used standard white cardstock to print the pop-up portion, as well as, the outer card. The volcano image was found through a Google image search and than altered in Paint.net, using the Effects tab, Artistic and Ink Sketch. 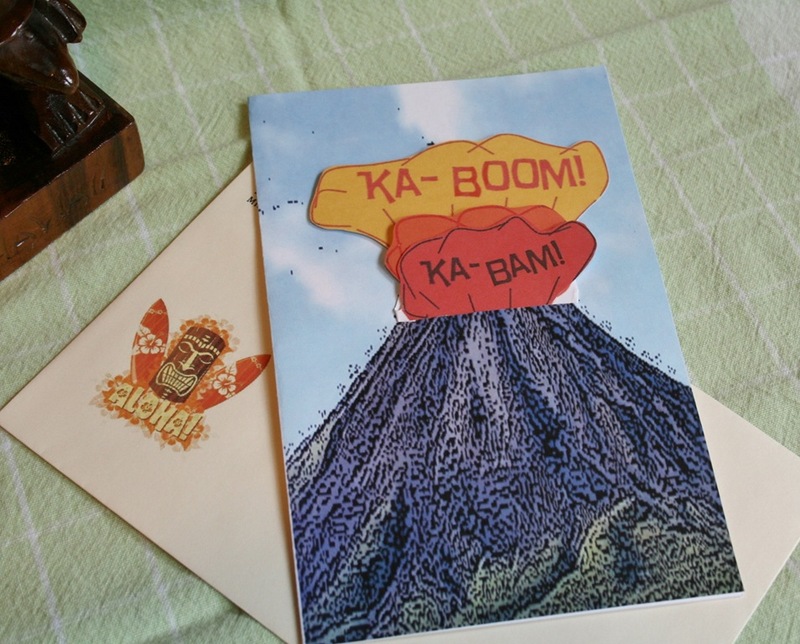 I printed the volcano image on one half of another sheet of white cardstock so that, after trimming, the blank side could be folded around to the backside of the volcano base image. 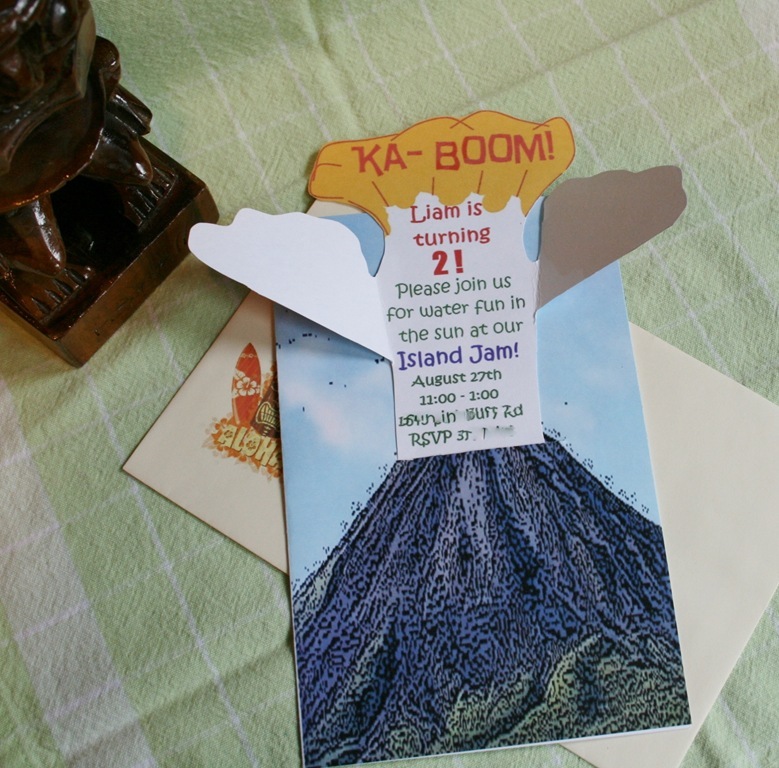 I ran an Exact-o knife across the top portion of the volcano image to create a slit just wide enough to hold the folded “eruption” styled message. 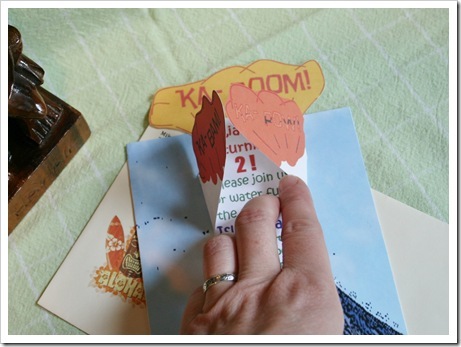 After folding the eruption puffs in, I slide the message through the slit in the base card. 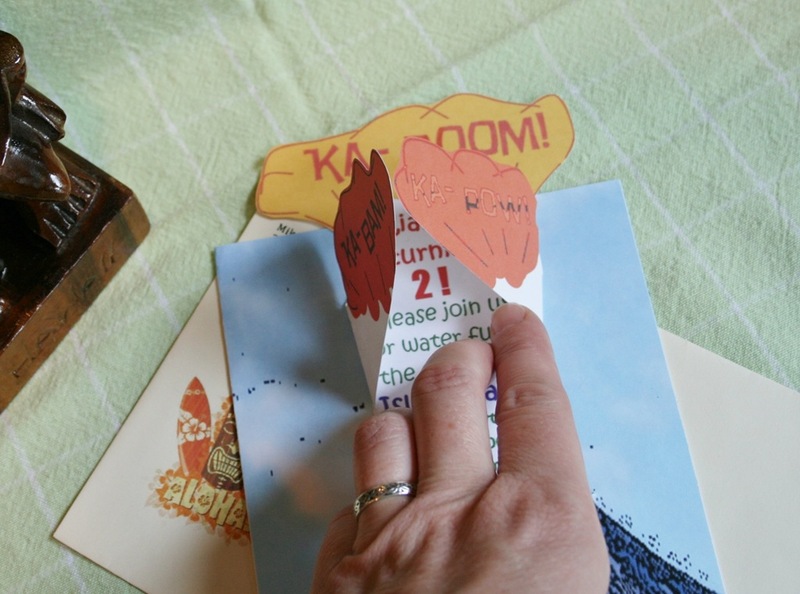 Then I folded the flap over the back side of the volcano image and using a glue stick I secured the back of the base card to the front, covering the inner workings of the pop-up message. 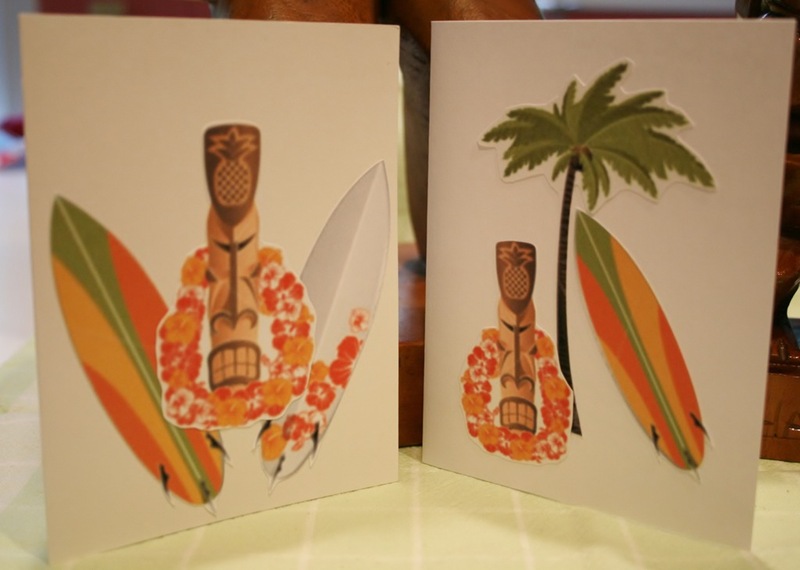 I also printed those envelops shown above with our return address in the “Hurry Up” font and another found image of a tiki with surfboards, and the greeting, “Aloha”. It all came out with a nice island vibe, but not too girlie which was my concern about this theme from the get go. I figured if I stuck with tikis, surfboards and volcanoes we would be golden. 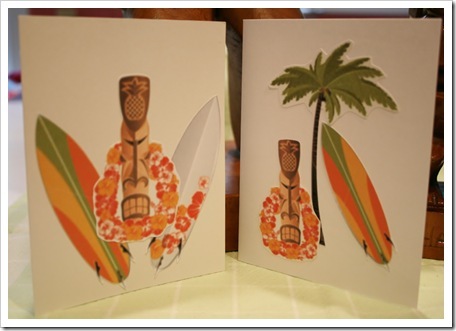 I even used more images captured through a Google search to create the thank you cards, again with a tiki and surfboard theme. 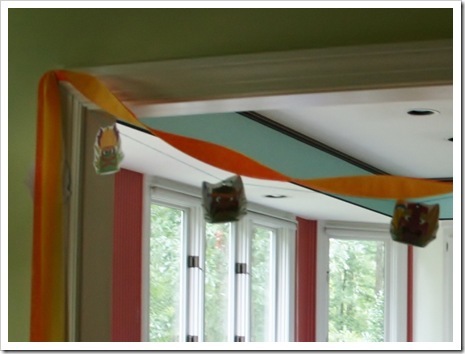 We used orange and yellow streamers to decorate the formal living and dining rooms, along with the kitchen and the family room. 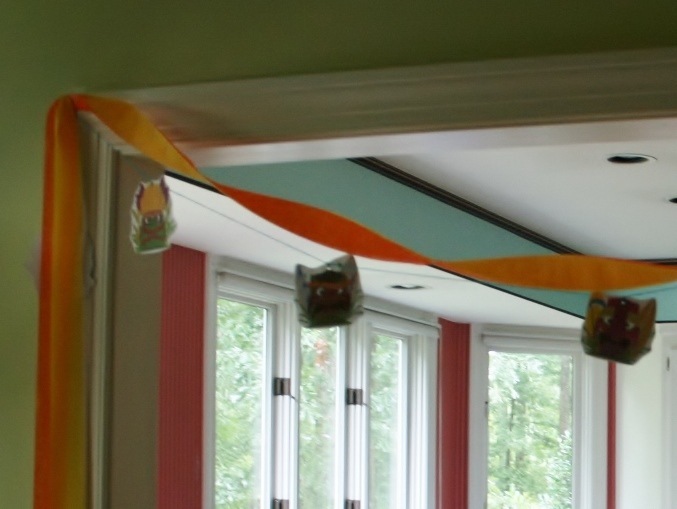 Out of all the streamer colors I picked up, these seemed to match most closely with the majority of the printed materials, i.e.- the invite, cake decorations and the thank you cards. 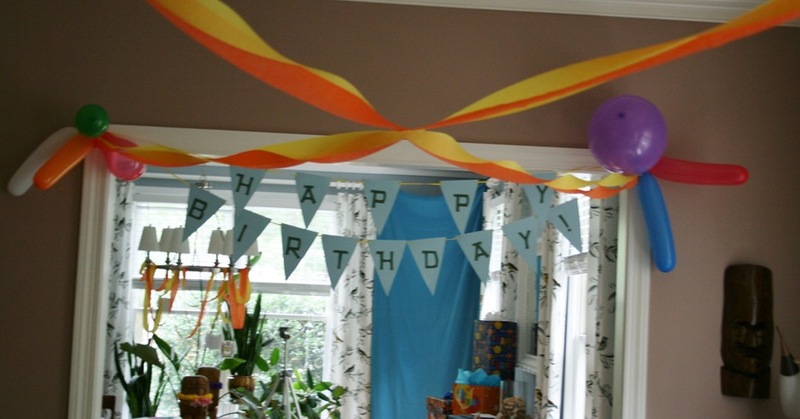 At the last minute I also put together a simple pennant “Happy Birthday” banner using old light blue cardstock I had on hand and the same “Hurry Up” font used in the invites. 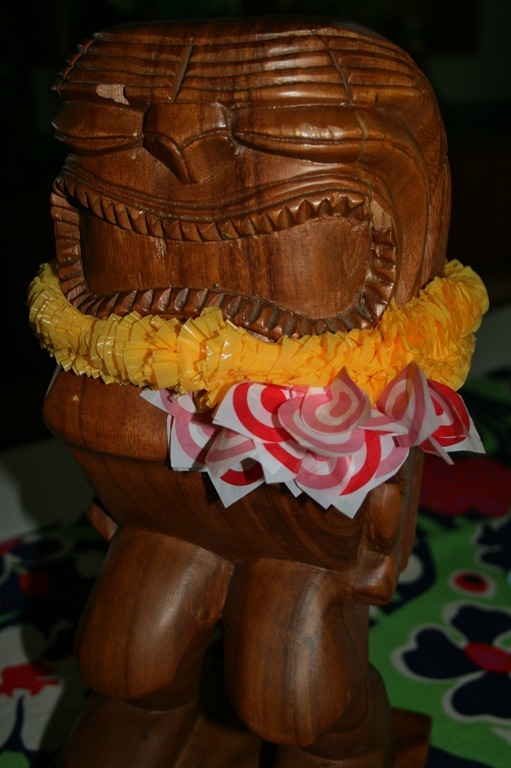 Tabletop tiki with plastic flower embellished lea. We also kept the food simple for this gathering so that we could feed everyone and stay within budget, which by the way, I set at $50.00. Yep! I know, insane, right? I will follow up on that more later. We wanted to have the party from 11:00 to 1:00, so that meant we needed to serve up some lunch. Hotdogs seemed like the easy way to accomplish this. Plus, they could act as our roast pig for the island party theme. We offered up hotdogs, buns, ketchup, mustard and relish. Simple. Along with our “roast pork” we had a big bowl of regular potato chips and another large bowl full of veggie straws. We put these out early so that everyone could munch while chatting and waiting for the dogs to come off the grill. My poor Mister manned that grill through torrential downpours, by the way. What a great dad! To decorate the cake I simply cut out more images found on Google and stuck them right into the frosting. 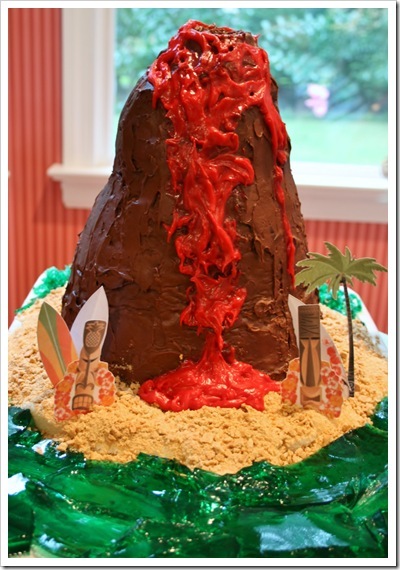 Since the cake was in the shape of a volcano, complete with a red lava eruption and dry ice smoke, I figured the rest of the decorations could be pretty simple. 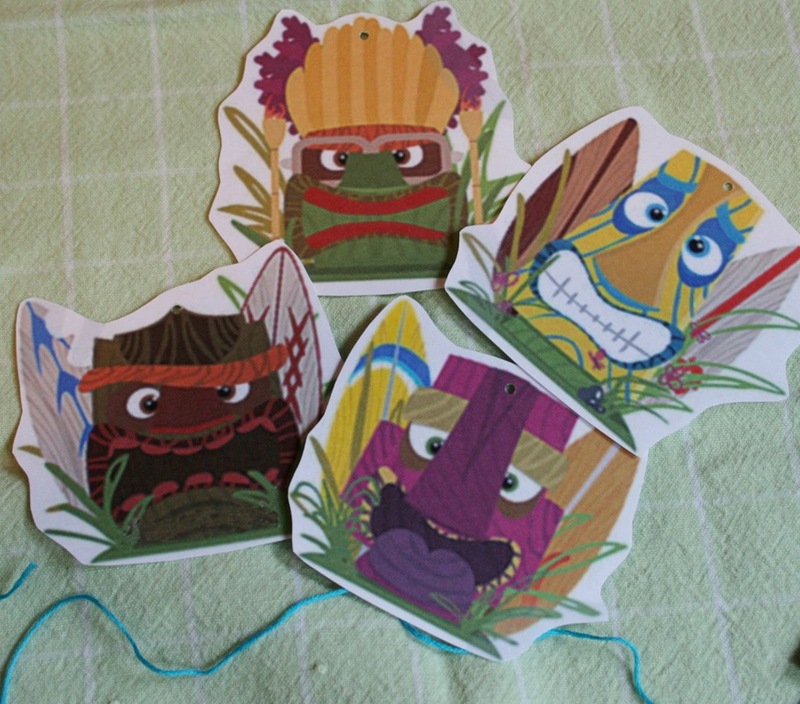 I used a couple of Tiki head cut-outs, a couple of surfboards and a palm tree. He was just dying to grab those little tikis up front and play with them. After each cake thoroughly cooled, I stacked them up sans any icing in between the layers since they are so sticky any way. I shoved the foiled wrapped paper towel tube down the center and then began to carve away at the top two cakes to get more of a tapered mountain shape. I used pieces of the carved away cake to cover the very top of the tube and then iced away! I made homemade chocolate frosting from the recipe right on the back of the Hershey’s baker’s cocoa box and put one thin layer on to start in hopes that it would bind everything together. I slipped the whole cake into the refrigerator to keep cool until the next morning. I believe this was the key to keeping this cake upright. The weight of the first layer of frosting was already bringing the cake down and pulling it away from the top edge of the inner tube by morning. I was able to use the second layer of frosting to smooth out the imperfections and cover the exposed tube. Using the pieces of cake that had been carved away I created a beach around the volcano base, which I then sprinkled with crushed graham crackers to look like sand. The night before I also attempted to make a huge pan of Jello Jigglers in a deep blue green to use as water around the island volcano, however the pan jelled up very quickly and I was not able to get the wave effect I was going for. Rather than toss it all out I decided to use it any way and the chunks of blue green Jello did give the look of water after all. Just before guests arrived I took a tube of red Betty Crocker icing and warmed it a bit in a cup of hot water. 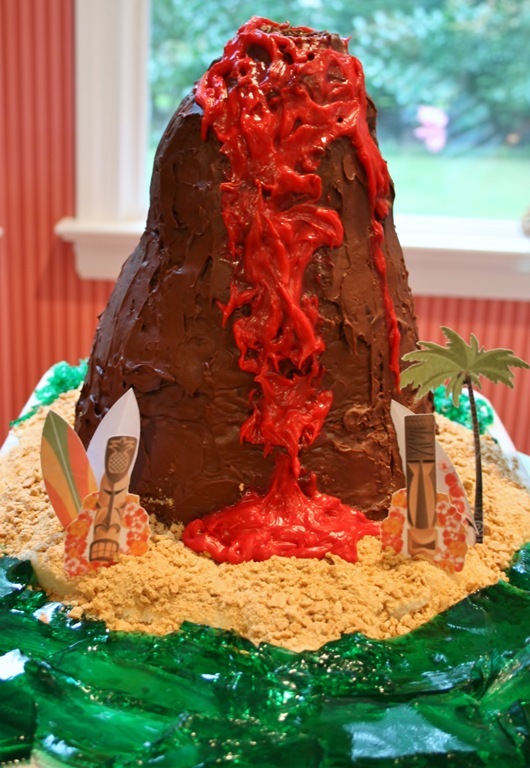 After just a few minutes warming and then a little kneading of the tube I squirted it around the top edge of the volcano and down one side. 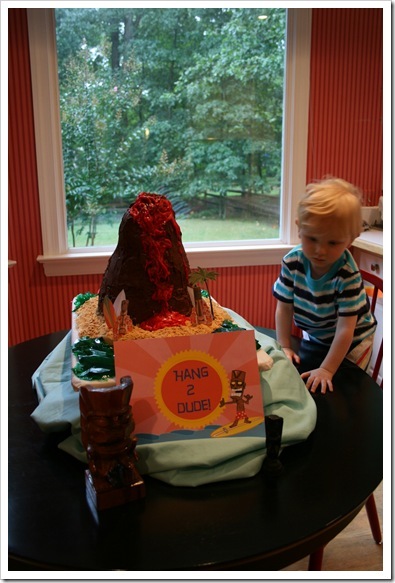 After adding the paper cut outs the volcano really took shape. The Little Guy had been begging to eat it from the moment the first angel food cake came out of the oven, so he was anxious to see the smoke and dig in. We waited until time to cut the cake to perform the smoke eruption because my big 5 pound block of dry ice had dwindled to almost nothing by morning despite the reassurance of the dry ice company pamphlet that it would last for days in a cooler. Liars! I was just happy that we had enough to get a couple of good smoke eruptions before calling it a day. Last, but not least, we wanted to send each child off with some kind of small gift. I had hoped that the beach towels would go on sale soon enough to fall into our price range (two summers ago I scored a really nice, big one from Target for $2.75) so that I could roll them up and then add a beachy raffia bow. 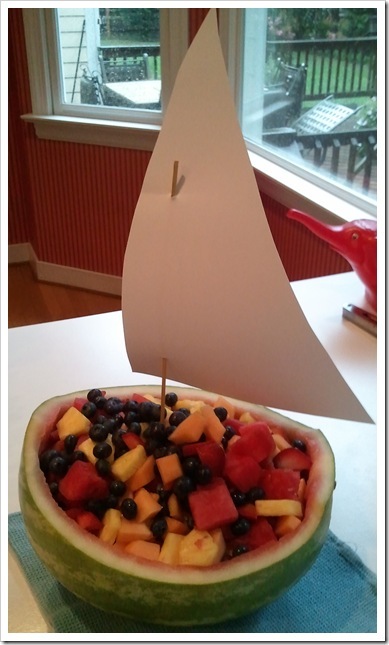 Perfect for an island theme, right? Well, no luck. At the last minute I decided to grab some bottles of bubbles (always a hit with this age), snacks and stickers. I looked all over for stickers with an island sort of theme, but only came across some fruit shapes. I figured that was fine since all they want to do is pull them off the backing anyway. 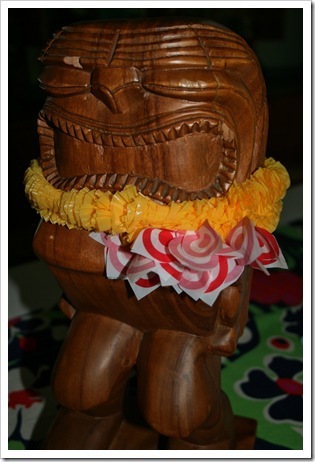 Again, I used another tiki with surfboard image from my Google search for the name tag background. After printing the images I cut them out and added each child’s name with foam stickers. 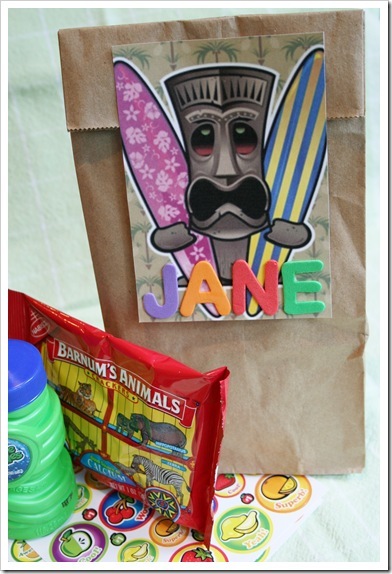 We filled paper lunch sacks (I figured the brown was sort of beachy), folded over the tops and added the name tags with a bit of tape. Wholla! Party Finneet-O! *Please Note: This number reflects actual usage. In other words, some of the items were purchased in larger quantities than what was actually used. If I add up the actual cost of everything, including what we did not use, or eat, the grand total is in the neighborhood of $68.00. Still not bad for a gathering of about 20 people. It was a lot of work, but a definite labor of love. Happy 2nd Birthday my sweet William!